A Turkish-Saudi Military Offensive in Syria? 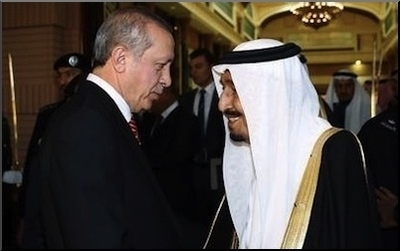 Turkish President Recep Tayyip Erdogan (left) and Saudi King Salman (right) are rumored to be contemplating joint military action in Syria. On June 22, 2012, a Turkish RF-4E military reconnaissance aircraft took off from an air base in eastern Turkey. It flew at low altitude, as most spy planes do, and violated Syrian airspace before it was hit -- most likely -- by a missile fired from a Syrian- or Russian-operated air defense system. Two Turkish pilots were killed. Their bodies were later recovered from the Mediterranean Sea with help from a US ship. Turkey was all rage. Turkey's then-prime minister (now president), Recep Tayyip Erdogan, vowed revenge. The Turks claimed their aircraft was flying on a training mission. It was most likely flying on a mission to spy on air defense systems in Syria. Nearly three years later, on the morning of March 25, a Russian-made Syrian Scud missile, estimated to have been fired from a range of 180 kilometers, exploded near the Reyhanli district in Turkey's southernmost city of Hatay, near the Syrian border. The missile left a 15-meter-wide crater in a stream bed, broke the windows of the surrounding houses, caused the roof of a building in the nearby military base to collapse, damaged two military vehicles and inflicted minor injuries on five Turkish civilians. Luckily, there were no fatalities. But the incident, once again, revealed something about the comparative military capabilities of NATO's second biggest army, and a much weaker but sufficiently deterrent enemy. Lately, there have been reports that Sunni regional allies Turkey and Saudi Arabia have been planning a joint military offensive against Syrian President Bashar al-Assad's regime in Damascus, a Nusayri [Alawi] nemesis for both Turkey and Saudi Arabia. The reports claimed that the planned operation would involve both ground troops and air strikes. A joint Saudi-Turkish military offensive in Syria is not a realistic scenario. There are a number of reasons, both on the local (Turkish) level and on the regional level, why this is not a realistic scenario. Presumably, the Turkish-Saudi force would attack the forces of the Assad regime in order to topple Assad (a Turkish wish) and block Iran-backed Shiite dominance in the region (a Saudi and Turkish wish). Turkey wants Assad out in order to build a Muslim Brotherhood type of regime in Syria. But despite unconfirmed reports of a softer Saudi opposition to the Muslim Brotherhood, the facts on the ground remain simple: The Muslim Brotherhood is the worst enemy of Saudi Arabia's staunch regional ally, Egypt. Moreover, the timing of the alleged Turkish-Saudi offensive against Syria (but actually targeted more against Iran) looks unrealistic, given Iran's looming nuclear deal with the West. From a Turkish perspective, there are more practical reasons why war with Syria is probably a distant possibility. First, the Turkish government faces critical parliamentary elections on June 7, and politically it cannot afford Turkish soldiers returning home in coffins. Second, and more importantly, there are simple military facts that can turn a Turkish military campaign against Syria into a national disaster. The Syrian side of the Turkish border with Syria is home to more than 20 different radical Islamist and Kurdish groups, including the Islamic State, most of which are hostile to Turkey to different degrees. The groups fighting Assad's forces and supported by Turkey make up the smallest and weakest contingencies. A cross-border operation would be too risky for the Turkish military. Worse, any Turkish air raid to bomb Damascus would expose Turkish aircraft to the risk of being hit by the powerful air defenses in Syria. Turkish warplanes are not outfitted with the critical stand-off jammer systems that would blind enemy radars. Half of the squadrons of Turkish fighters that would fly over Syrian skies may not be able to return home safely. Turkey does not have a long-range anti-missile defense architecture to counter Syrian missiles. Then there is the bigger risk of Syrian missiles. The Scud that hit Turkish territory on March 25 proved that the US/NATO Patriot missiles stationed in southern and eastern Turkey could only protect the areas in their immediate vicinity. But Assad not only has Scuds he can fire from a range of 180-200 kilometers; he has in his arsenal unknown numbers of Scud-C ballistic missiles, which have a range of 500 kilometers, putting several big Turkish cities within range. Turkey simply does not have a long-range anti-missile defense architecture to counter Syrian (and/or Iranian) missiles. Being a member of the alliance, it can rely on naval NATO assets to counter such threats, but that would be too risky a gamble. It is true that the Erdogan administration has been weighing military options against Assad for the past couple of years. It is also true that Erdogan has an obsession about getting rid of Assad and is not the most peaceful leader in the region. All the same, the Turkish president is not a suicidal man. The odds are slim for a Turkish-Saudi military offensive against Assad's Syria.